Hello loves! How is everyone doing? I hope all is well with each of you! As for me, all is well on my end. I've been doing a bit of self-reflection these last few weeks, and I'm looking for a spiritual break-through to happen any moment now. Do you ever feel yourself getting "out-of-sync" with everything going on around you? Well that's sort of what's been happening to me. I've been so consumed with what's going on (and what isn't going on) around me that I haven't been taking the best care of myself. So I'm working to become more proactive about that. But on to other things, I've recorded my weekly to-do list and decided to share the main objectives with you guys this week. Hopefully you will want to share a few items on your list with me in the comments. Maybe you'll even be moved to offer some tips, encouragement, advice, and or resources with me as well! 1. Spend time with God each day as a family unit. Together, my children and I have created a weekly family devotional plan. And I couldn't be more excited to get started with it today. Though I've been researching ways to actively spend more time with Him as a family for a while, it felt good to get the children involved in the planning stage. They have their materials and resources ready! 2. Clean up the yard. My yard could definitely use some TLC. Anyone riding along the highway could tell me that. So I've included getting dirty and cleaning this mess up in my to-do list this week. I have flowers and trees to plant along with weeds to kill. And I can't wait to add a few more items to my honey-do list for hubby to complete lol. 3. Re-organize and re-purpose the "room at the end of the hall." One part of spring cleaning that I want to get accomplished this week is organizing the pink bedroom. I have a few ideas in mind (thanks to Pinterest) and I am bringing my daughter along for the ride. 4. Spring clean my closet. Just like the last few items on the list, cleaning my closet is imperative. This will probably take more than a week at the rate I usually go. Maybe I'll add this to the on-going monthly to-do list. 5. Read a book. Since my latest obsession with Korean Drama has devoured all of my free-time, I haven't read one single book. And that is so unlike me! This week I'm trying to get lost in a good read and get back in the habit of doing so regularly. Does anyone have any suggestions? And if you're as obsessed with KDrama as I am, what are your favorite dramas? 6. Tighten up my writing/blogging life. I have a writing project that has been sitting on my desk for a month. I need to get on that so I can share it with you guys! I also want to get back to writing something every day--even if it's just a journal entry. How do you guys go about finding writing inspiration? 7. Finalize Relay for Life fundraising efforts. I'm excited to be a part of Relay for Life again this year. It feels good to give time supporting and giving time to something my family and I are passionate about. I have a few plans for fundraising that I hope to discuss with my team a little more this week. 8. Exercise. I haven't committed to any exercise in forever. So I'm reintroducing myself to more physical activity by doing at least 15 minutes of cardio each day this week. If I can do that, I can get back in the swing of things sooner than I think! 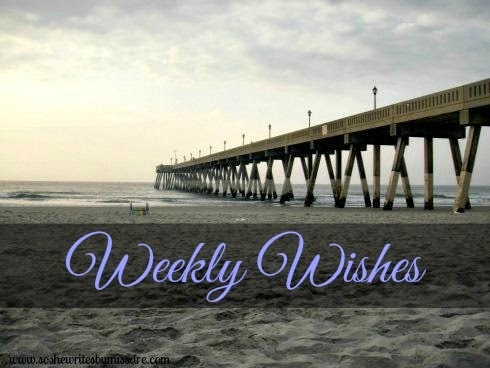 What are your wishes for the week? Tell me all about them in the comments.